Given our reputation as macrobiotic yoga-loving weirdos, it’s no surprise that Angelenos go to great lengths to pamper themselves -- but the lengths we go to for our four-legged friends can also be totally nuts. LA’s got dog-specific businesses that offer everything from blueberry facials, to mud baths, to doggie-psychic sessions, meaning there is an absurd amount of possibly absurd options for LA’s most beloved pet fanatics to take the meaning of “man’s best friend” to a whole new level. Take, on the “sorta crazy but also totally makes sense” end of the spectrum, Zoom Room. 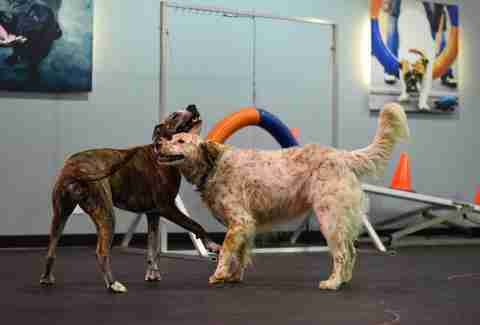 A franchise with multiple locations in LA, Zoom Room is sort of an indoor jungle gym that’s designed as a dog park alternative, specifically for owners to get just as much exercise as your dog. “The No. 1 distinguishing feature about us is that owners are present with their dogs at all times -- creating a better and lasting training experience plus great socialization for dogs and humans alike,” says Mark Van Wye, Zoom Room’s owner. That means human-sounding exercise classes like Pup-lates, which utilizes equipment found in human gyms to help with dog athleticism and strength, as well as Doggie Disco, which is basically a disco ball-abetted dance party where “The Sprinkler” is replaced with “The Pooper Scooper” (they also offer “Bark Mitzvah” services, wherein you throw your dog a “coming of age” ceremony, but no one’s actually taken them up on that for years). According to dog owners, though, Zoom Room’s not just about dogs having fun. “Chopper has blossomed and gained so much confidence that he is almost unrecognizable as the scared, shaking rescue pup he was when we started,” says Cynthia Hamilton, who, along with her dog, is a regular visitor. Zoom Room’s far from the only human-meets-canine workout in town. Personal trainer Bruce Gilbert hosts the Bow Wow Workout at Runyon Canyon Park in Hollywood, which mixes hiking with aerobics, muscle toning, balance, flexibility, martial arts, and visualization. “It’s a really good workout that includes both cardiovascular and strength training while also giving your dog the opportunity to socialize,” Gilbert says. Even to non-dog owners, those options sound relatively sane. But Doga -- a twice-monthly Sunday morning class at various Healthy Spot locations, where a licensed canine fitness instructor leads dogs and humans alike through poses like “puppy pose,” “double down dog,” and “pigeon pose,” could seem to border on ridiculous. But acolytes like Sharon Sandow swear that the class leads to unique bonding with her pup, Angel. “My dog definitely was unsure about doga -- she’s generally pretty timid. But [in the class] we started off with a dog massage, and as soon as I put my hands on her to massage her, she calmed down immediately,” Sandow explained. “The dog massage part of the doga, which is where we begin each class, really brings this positive and calm energy into the room, and all the dogs (including mine) settle down immediately. 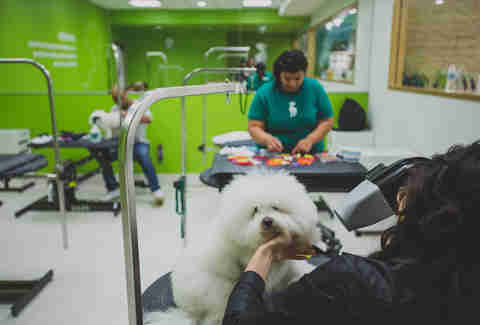 Dog massages are also one of the luxuries offered at D Pet Hotels, which is considered one of the world’s most luxurious dog resort, spa, and boutiques. They’ve got locations in Encino and Hollywood, and offer extensive accommodations to make puppies feel, uh, spoiled, including spa services like “pet-icures,” high-end doggie beds, and -- of course -- flat screen TVs, so your pooch, like you, never has to miss Life in Pieces again. Vigilant dog dad Barry Sonders has been bringing his beloved lab/pit mix, Sammie, to this hound haven for three years now for both boarding and weekly puppy playdates. “Last time I was in New York for a week, I dropped off [my dog] Sammie there for boarding and they said, ‘Well, we know Sammie doesn’t get along with so and so, and they are in for Tuesday and Thursday, so we’ll trade them off, but also, Sammie gets along with Big Lou and he’s here, so it’ll be great,” Barry explained. “I think that’s the main reason I love them so much is because you can tell they love us back,” he added. D Hotel’s not the only spot offering left-field wellness services for dogs: every appointment at Healthy Spot includes standards like a bath, brush, and hand dry, as well as options including moisturizing paw rubs and blueberry facials. “The blue color of the shampoo optically enhances yellow and orange stains, making them lighter,” she adds. Of course, for truly committed dog owners it’s as important to focus on inner wellness as outer health, which is where Lydia Hiby comes in. The pet psychic claims to be fluent in dog -- and has been communicating with animals for 20 years, offering one-on-one consultations to help better connect with your pal. Each 15-minute paw reading includes a full body scan as well as all pet questions answered so you can know exactly what’s running through your furball’s head. Hilby takes her practice seriously, and so do dog lovers like Eileen Edelblute, who has utilized Hiby’s Dr. Dolittle-like powers for multiple pups over the years. She once brought her Great Dane, Penny, in to see the animal communicator when she didn’t seem like herself one day and found she had been suffering from a previous neck injury that occurred with her past owner. “It was strange because I hadn’t noticed anything going on [with Penny], but she told Lydia when she had a collar on and she would raise her neck it would hurt her. “She really astounded me because she was able to tell me things that there was no way she could have known unless she was reading my mind or communicating with my dog,” Edelblute claims. Upon taking Penny in for X-rays, the vet confirmed Lydia’s suspicions, finding an old injury in her vertebrae that could be causing strain on the oversized pooch’s neck. “Using Lydia is one of the ways I pamper my dog. 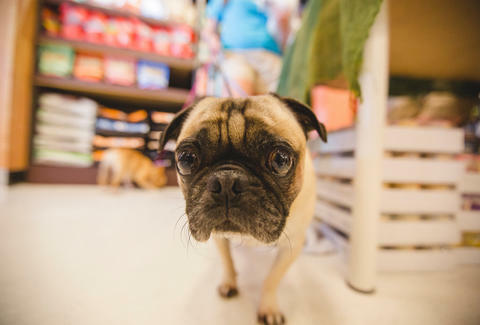 It’s a really great resource to becoming a better dog owner and thinking about ways to interact and also take care of my dog that I wouldn’t have known based on taking her to the vet or the trainer,” the spirited pet owner said. It’s hard to hate on people who are so committed to their canine friends -- even if things like doggie pilates and psychics seem absurd to non dog-lovers, it’s clear that the Angelenos who use these services live by them, too. And that’s nothing to bark at. Taylor Casey is a freelance writer who somehow doesn't own a dog, but she'll gladly take yours off your hands. Ask her to dog sit on Twitter and Instagram @taylordcasey.